When Sylvia Quinn joined her husband on the track one day in 1969, she didn't make it even one lap. She blamed it on the shoes. So she got new athletic shoes, and she made a plan to run 600 miles while her husband was deployed from Fairchild for six months. "I decided I was going to become a runner while he was gone," she says. At that time, the concept of "jogging" was becoming more popular across the United States. 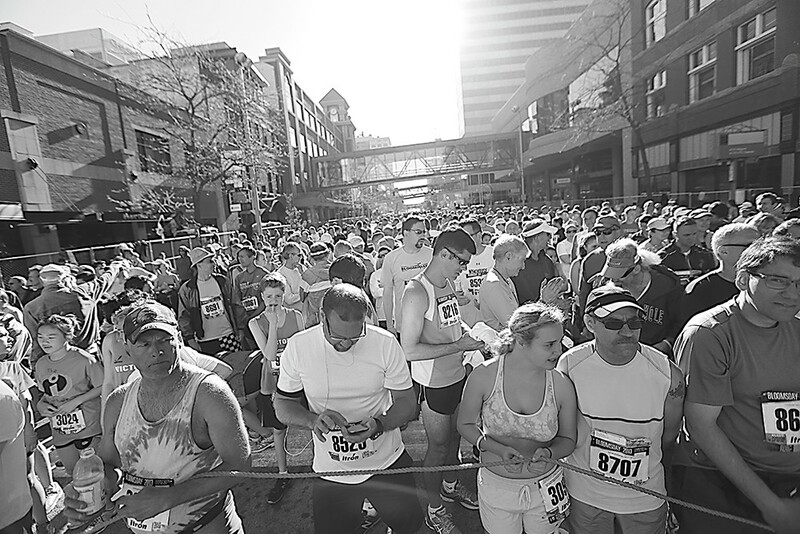 Running clubs were springing up nationwide, and some communities and clubs had started hosting road races. Quinn's first race was the very first Bloomsday in 1977 — and she won her age group. Now, at 77, she's competed in every single Bloomsday since the very first, and has won her age group nearly every year. She and her husband, Patrick, are two of 99 remaining Bloomsday "perennials" who've never missed a single year. If it takes one type of courage to get out and take the first steps toward becoming a runner, it takes a different type of will — and good fortune — to continue lining up at the start, year after year, through injuries and course changes, and then make it to the finish line. The first Bloomsday happened right around the time Bart Haggin started running, but he signed up for the 1978 Bloomsday and hasn't missed one since. "When I ran my first one, I think the farthest I'd ever run was four miles," he says. Haggin takes the competitive part of Bloomsday seriously — he's frequently been in the top finishers for his age group, and he's crashed at the finish line a couple of times. He hasn't entirely avoided injuries, and he says the important thing is to learn from them — any endurance athlete who's training seriously has to learn how far to push without getting hurt. For those who just want to stay fit and stay with it, he says, the key is carving out space to make running a priority in your life. "That's the trick: to figure out how to get addicted to running enough — a positive addiction — that it takes you out the door with a pair of running shoes," he says. Quinn, who also was Bloomsday race director from 1983 to 1991, has seen the race grow from a core of runners into something much bigger. "Anyone can get out there and if they have the will, they can do it," she says. With advanced osteoporosis, Quinn has battled stress fractures — she once ran Bloomsday with one, and ended up with two — and no longer worries as much about speed when she goes out to run. But she's not about to miss Bloomsday, and she also competes each year in the Coeur d'Alene Marathon, which also started in 1977. She's glad to see Bloomsday participants return year after year — many walking, or with strollers and kids — for the tradition of crossing the finish line. At the front, she says, it's a race. At the back, it's an event.